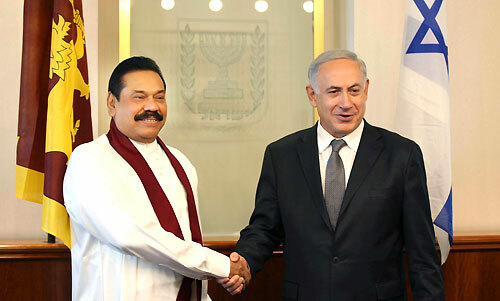 Sri Lankan President Mahinda Rajapaksa and Israeli Prime Minister Benjamin Netanyahu held bilateral discussions at the Prime Minister’s Office in Jerusalem, Israel on Wednesday 08 January. President Rajapaksa arrived in Jerusalem this morning together with First Lady Shiranthi Rajapaksa for two days as the final destination on his Middle East official visit. The bi-lateral discussions mainly focused on the areas of agriculture, Information technology (IT), water management, trade and employment. During the talks between President Rajapaksa and Israeli Prime Minister Benjamin Netanyahu, both leaders agreed to expand bilateral relations in a number of sectors, including trade, agriculture and water. Israel is known for the drip irrigation technology for the agricultural sector to cope with the water crisis in the region. Another water-related technology that was discussed was desalination, a process through which potable water is produced from sea water. Israel Premier agreed to provide technological assistance, including support to expand the scope of utilizing the drip irrigation system in Sri Lanka. IT and employment were other areas identified for strengthening cooperation between the two countries. There are roughly 7000 Sri Lankans currently working in Israel as care workers. The two leaders agreed to work towards increasing employment in this sector as well as seasonal employment in agriculture. Israel pointed out that Israeli farmers are quite satisfied with quality of Sri Lankan employees working in the country. 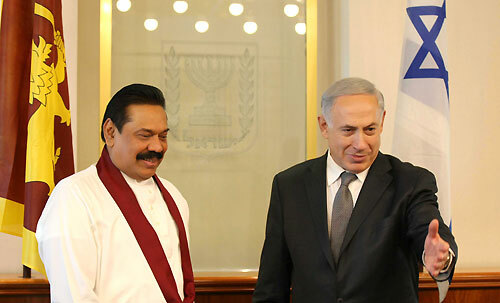 President Rajapaksa also thanked Israeli Prime Minister for the humanitarian assistance provided to Sri Lanka in the aftermath of the 2004 tsunami. President Rajapaksa is the first Sri Lankan head of State to visit the State of Israel since its inception in May 1948. The Israeli delegation comprised of Israeli National Security Advisor Yossi Cohen, Chief of National Information Directorate Liran Dan and Non-Resident Ambassador to Sri Lanka in New Delhi Alon Ushpiz, Ambassador of Israel to the United States Ron Dermer. The Sri Lankan delegation comprised of Minister of External Affairs Prof. G. L. Peiris, Monitoring MP of the Ministry of External Affairs Sajin Vaas Gunawardena, Parliamentarians Roshan Ranasinghe, Secretary to the President Lalith Weeratunga and Sri Lanka’s Ambassador in Tel Aviv, Israel, Sarath Wijesinghe.